Keeping equipment maintained at peak performance is vital to any organization. eMaint has provided organizations with the industrial maintenance software they need to increase equipment reliability, lower maintenance costs and ensure regulatory compliance since 1986. Recently purchased by Fluke, eMaint is a comprehensive computerized maintenance management tool that offers powerful features for an attainable price. This flexible tool can be configured to fit a range of industry-specific needs. It provides inventory and asset management in its CMMS platform, doing the job of three software solutions in one. The core modules eMaint offers include work order management, preventive maintenance, inventory management and purchasing, reports and dashboards, as well as predictive maintenance. The reporting features from eMaint are also very robust. Users can create their own reports or use one of dozens of preloaded reporting options. You can set security settings on your reports so they are private or in a read-only format. This CMMS solution offers a range of subscription packages to fit a variety of industry and business needs. It’s also scalable, so as your business grows, your CMMS can grow with you. Users also receive access to unlimited helpdesk support, daily data backup and software updates. The CMMS from eMaint is web-based, so users can access it on the go from multiple access points at once from a range of mobile devices. That way your service technicians can upload meter readings, warranty information, equipment specs and other documents directly from a mobile device to the platform. This CMMS platform begins at $33/user/month. Hippo CMMS is a user-friendly computerized maintenance management software solution. It provides a robust range of modules and tools for all your maintenance needs. Users can easily store and access asset data like warranty information, operation and maintenance manuals, ID tags, and more. Hippo’s preventive and predictive maintenance features will help you maximize the longevity of your assets at a reasonable price. Work order management is easy with Hippo. This solution lets users submit work orders to assigned technicians as well as track requests and closures. Users can attach documents and other information such as ID tags or photos with corresponding assets. Hippo’s reporting and data visualization tools come with customizable dashboards and interactive drawings of site maps and floor plans with Hippo Advanced Dash. Users can interact with floor plans and work orders or asset monitoring in the same dashboard. This CMMS is dedicated to customer support — it offers lifetime tech support and a range of training material. Users can access unlimited free training and on-demand video tutorials for the first six months after you sign up. This cloud-based application lets technicians update work orders on the go. Hippo CMMS packages begin at $45/user/month. UpKeep is a modern, intuitive and customizable CMMS that is proven to expedite workflow processes. This affordable solution is designed with in-the-field agents in mind. It allows users to snap a picture of a broken piece of equipment, create a work order and send it off to their technician for repair — all from a mobile device. UpKeep is equally suited for facility, property, restaurant and manufacturing managers looking to improve communication by enabling real-time status updates for your team. Users can customize work order forms to fit their business’ needs, prioritize work orders and assign them to individual technicians. Because of its user-friendly interface, this CMMS requires minimal training and implementation. It offers collaborative functions like a team calendar to improve and streamline communications between technicians and managers. It also allows managers to set role-based access restrictions on work orders. UpKeep also offers electronic signature, image upload and annotation, barcode scanning, PDF integration, and daily data backup. UpKeep has an open-source CMMS plan that offers a free basic package. FastMaint is a computerized maintenance management software platform for maintaining your organization’s assets. It specializes in industrial and manufacturing specialities but is available for a range of industry-specific businesses. This CMMS offers modules for asset tracking, maintenance planning, breakdown maintenance, preventive maintenance checklists, inventory management and maintenance scheduling. These activities can be scheduled based on dates, readings and conditions. Users can import and export tasks, create custom fields for work orders and create task templates. FastMaint also includes new features such as barcode scanning functionality, purchase order creation within work orders and reporting in addition to email and text integration. Users can generate reports — many of which are customizable — and display them in easy-to-read dashboards. This solution offers both web-based and Windows on-premise deployments as well as scaling packages (Basic, Standard, Professional and Web) so users can choose the perfect solution for their organization. FastMaint offers email support, video tutorials, a searchable consumer FAQ and a knowledge database. FastMaint offers a one-time licensing fee of $495 for on-premise deployment and a subscription plan starting at $100/user/month. Maxpanda isn’t just a CMMS with a cute name — this little system packs a punch. It offers a suite of tools that includes integrated asset management, inventory management and preventive maintenance. The work order management tool allows users to set up automated alerts, create customizable task lists and upload documents. This CMMS keeps labor and material costs, contractor management and vendor invoicing in the same centralized location as the maintenance management activities. The work orders and vendor management modules contain department management functionality to compartmentalize tasks. Maxpanda also has a collaborative private messaging system, so users can communicate instantly across locations. This solution offers QR code scanning features and sophisticated role management functionality. Priorities can be hidden from viewers and submitters within work orders, and guests can create work orders via role-based access to the service portal. Necessary users are notified via push notifications when orders are submitted, completed or closed. Compare Top CMMS Software Leaders. This web-based solution can be accessed on-the-go from any portable device. This CMMS is unique in that it offers users a pay-as-you-go subscription option that can be cancelled at any time. It comes in five pricing plans to scale to your organization’s needs. This is an excellent affordable CMMS option as it doesn’t charge set-up, data backup or software maintenance fees or tie you into long-term contracts. Maxpanda also offers 24/7 technical support via the CMMS dashboard. Maxpanda can be yours for a monthly fee of $29/user. Maintenance Pro CMMS is designed in a branching structure that allows users to categorize and organize equipment within the system. Users can assign one of over 200 icons to individual equipment and categories for quick navigation. This CMMS provides automated, color-coded preventive maintenance alerts on each piece of equipment to help users keep their assets in peak condition. It comes with a predefined list of preventive maintenance services, but users can also customize it or create completely original lists to track maintenance scheduling. You can track maintenance by date, mileage, hours or kilometers based on the type of asset you are tracking. Maintenance Pro offers a parts and inventory system for itemizing and logging necessary parts. It provides forms for logging information like part numbers and descriptions, unit costs, vendors, etc. The inventory management module allows users to manage reorder notifications, part associations and make purchase orders. The reporting tools that come with this CMMS are noteworthy as well. Whether it be simple equipment listing reports or detailed periodical cost analysis, the built-in reporting functionality can do it all. Users can create custom reports with the report designer tool or adjust existing templates. This Windows-only solution offers both on-premise and cloud deployments to offer clients freedom of choice. The one-time licensing fee includes lifetime technical support via phone and an online community knowledge base. This CMMS has a variety of packages starting at a one-time fee of $649. This CMMS allows users to organize your equipment and maintenance plans. ManWinWin controls, integrates and manages work order requests as well as issues corrective work orders. It has powerful facilities management capabilities and is ideal for organizations in a range of industries and sizes. The work order calendar comes with drag-and-drop tasks and color-coding capabilities to make scheduling maintenance as easy and intuitive as possible. Implementation is quick and painless to save users time and money. ManWinWin provides datasheets with important information on asset location, parts, relevant codes and warranties, corresponding vendor data, and images. Users can compute costs and cross-analyze data with the reporting dashboards from this system. The KPIs in these reports can be easily customized and defined to meet users’ needs. ManWinWin is available in English, Spanish, Romanian, French and Portuguese. It is reasonably priced on a per-user annual basis and comes as a cloud-based or hybrid solution. Users have access to phone and email support, video tutorials and a comprehensive community knowledge base. This is a completely free maintenance software option. Fiix Software is an enterprise asset management software that helps users manage and schedule maintenance to keep assets in peak condition. This solution can be implemented across multiple facilities and is ideal for small to medium-sized organizations. This solution allows users to connect directly to their machines in order to read critical sensor data. This automatically triggers maintenance alerts, auto-scheduling maintenance efforts. Fiix offers a drag-and-drop calendar, simplified work orders, purchase orders, as well as parts and supplies tracking. Users can import assets from other systems and integrate their ERP, a larger CMMS or other software seamlessly. Fiix encourages technician self-service, asset lifecycle improvement, increased productivity and reduced expenses over time. 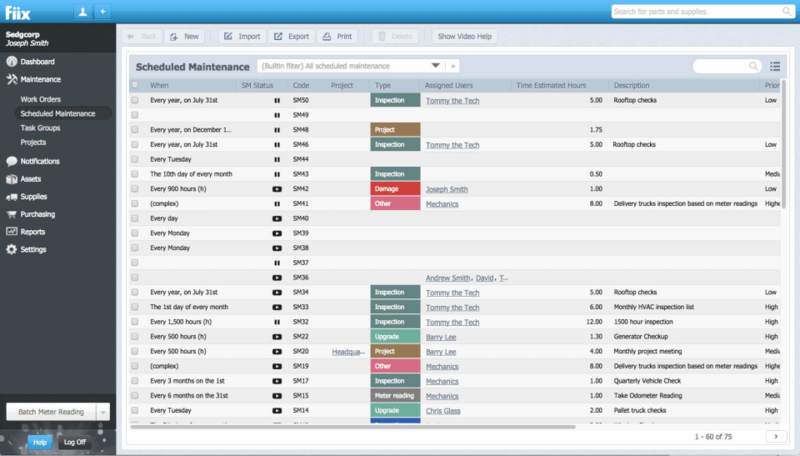 If you’re looking to get maintenance management software free or cheap, you’ll find a range of price and quality. These CMMS options are the best of both worlds — affordable and robust, sure to give you satisfying bang for your buck. What are your thoughts? Do you have open-source CMMS software you use and love? Have you tried any of these vendors? Let us know in the comments! iMaint is robust CMMS/EAM with pricing as low as $60 per user per month. It would make a great addition to this list! Thank you for reading and sharing your thoughts! iMaint is definitely a strong CMMS contender. We’ll make sure our analyst team includes it in their research for the 2019 update of this post! Why NewWayService is not listed here? It is a very affordable cmms application. Hi Robert! There are a huge number of CMMS platforms on the market, so we don’t have every single one on our radar. I’ll make sure our analysts are aware of New Way Service so we can evaluate it and potentially include it in future articles!